There are many species of halocarbons, and it would be time consuming to detail the increases in atmospheric concentration of these species. Concentrations of halocarbons are typically measured in pptv. Those with solely anthropogenic sources have increased from zero concentration since they were first manufactured in the 1930s. There is now evidence (Kaye et al., 1994) that the growth rates of species covered by the Montreal Protocol are slowing significantly. 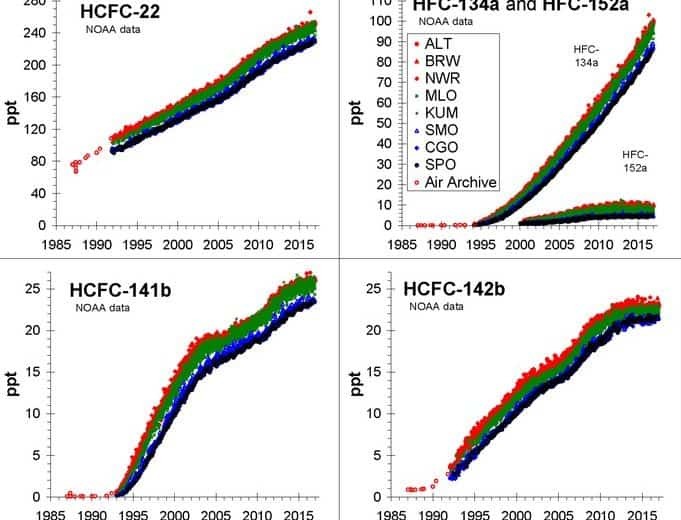 Current atmospheric concentrations for CFC-12 are shown in Table 6.2 (section 6.4.8).